This week was the letter "T" for the Food: A-Z project. Can't believe the project is almost over! I decided to make tamales this week. I grew up helping my mom make tamales when I was a kid but never actually made them myself until now. This project is turning out to be a "food I always wanted to make" project. Mom still sends me some when she makes a batch. When she makes them, she makes a lot, like probably at least 100, maybe 200 and freezes them. If you don't feel like making dinner/lunch, just pop them in the microwave for a minute or two and you're good to go. My batch ended up making 22 tamales. I will probably put most of them in the freezer too. I pretty much made up my own recipe. I took a look at a couple online and got some general ideas of what spices to use which is pretty much what I had in mind to use already. I did find one recipe on cooking-mexican-recipes.com that had some Ibarra chocolate in it which I just happened to have so I threw some of that in there. I don't think mom ever used that in her tamales. Here's the recipe I threw together. Soak corn husks in hot water for at least 1 hour up to overnight. Put something on top of them so they submerge in the water and don't float. I used a pyrex measuring cup. Gently separate the husks. I make two piles, one with short small husks and another pile for the larger husks. If some are torn you can use one of the smaller husks to fill the gap and over lap them before putting masa on them. Pat dry with a towel just before filling or masa will not stick to husk very easily. Soak chipotle peppers in hot water for about 30 minutes to soften. While peppers are soaking, fill a large pot with chicken broth (I used water + 8 chicken bouillon cubes). Add chili powder, cumin, garlic powder, salt, red pepper flakes and chocolate and bring to a boil. 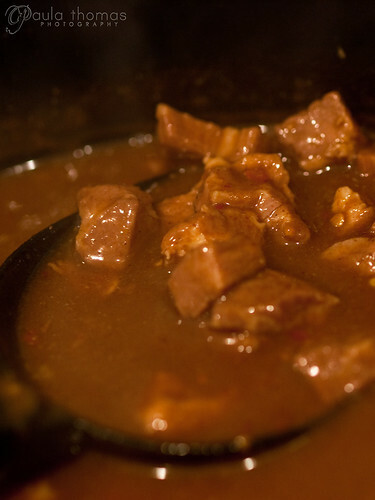 Simmer on low while you cut the pork into 1/2-1 inch cubes, or larger pieces if you want shredded pork. Drain water from chipotle peppers and remove stems. Put softened chilies in a food processor and add about a half cup of the liquid that is simmering to make a paste. Add the pork and chipotle paste to the simmering pot of water and stir to mix. Partially cover and simmer on low for 2-3 hours until pork is very tender. Combine the cold water with the flour and whisk until there are no clumps. Turn the heat up until boiling and slowly add flour mixture while stirring for 3-5 minutes to avoid clumps then turn off heat. In large bowl, beat 2/3 cup shortening until fluffy. In medium bowl, combine masa and 1 teaspoon salt. Alternately add masa and broth to shortening, mixing well after each addition. Gradually beat in 1/3 cup melted shortening, mixing to consistency of thick cake batter. Add additional water or masa mix if needed. Spread approximately 2 Tbsp masa batter in center of each husk. Spoon 1 Tbsp meat filling lengthwise down center of masa. 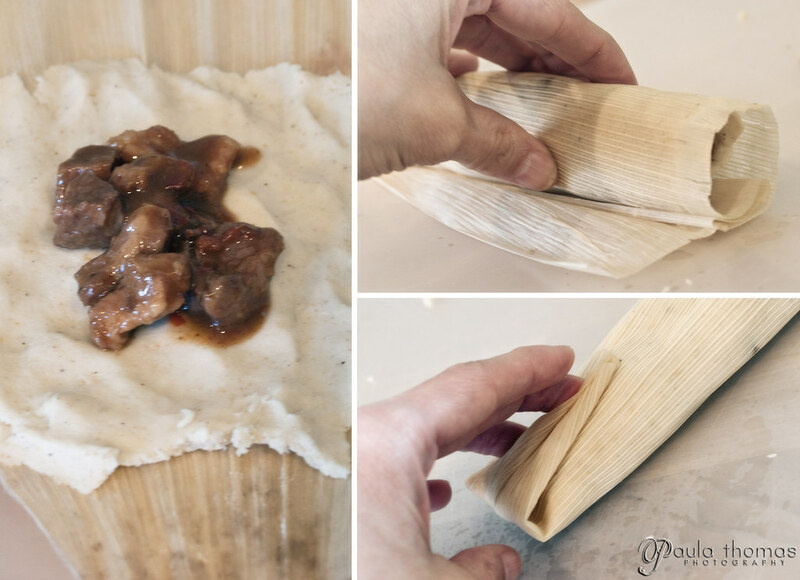 Fold husk over filling, allowing plain part of husk to wrap around tamale. Fold bottom end up over enclosed filling. Steaming: In steamer or 4-qt. Dutch oven, place rack 2 inches above gently boiling water. 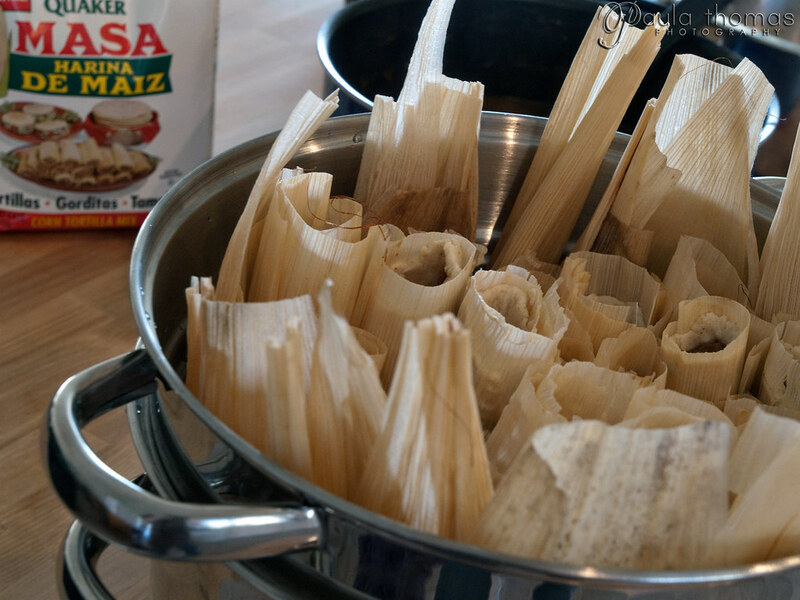 Arrange tamales upright in steamer basket. 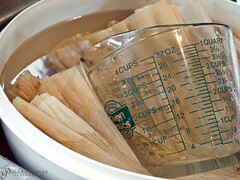 Do not pack tightly as tamales will expand during steaming. Fill in spaces with extra corn husks to keep upright. Cover top of tamales with additional husks; cover, steam 2-1/2 to 3 hours or until tamales are firm and fall away from husk. Wow, that's a really long cooking time! You have to prepare those ahead of time. They look incredible, though. YUM! Thanks for sharing! 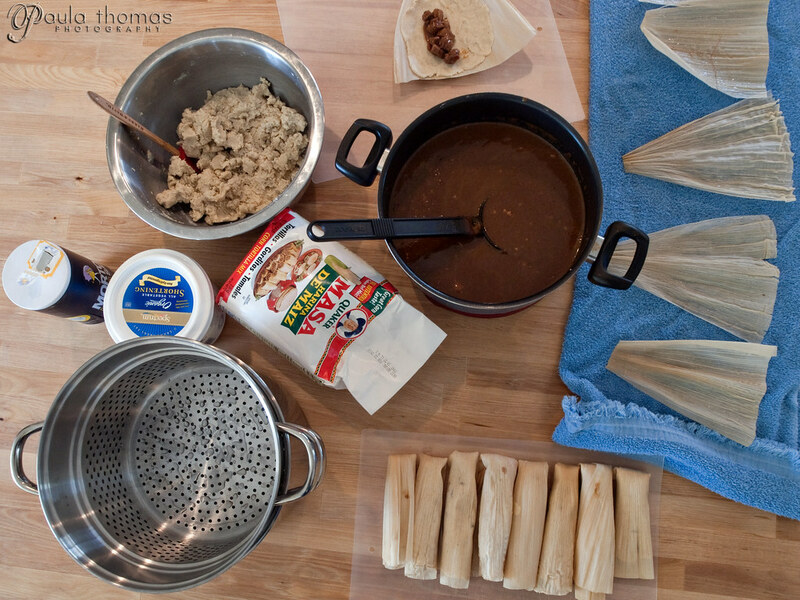 It appears that we both have tamales on the brain because i posted a recipe for tamales just a few days ago! 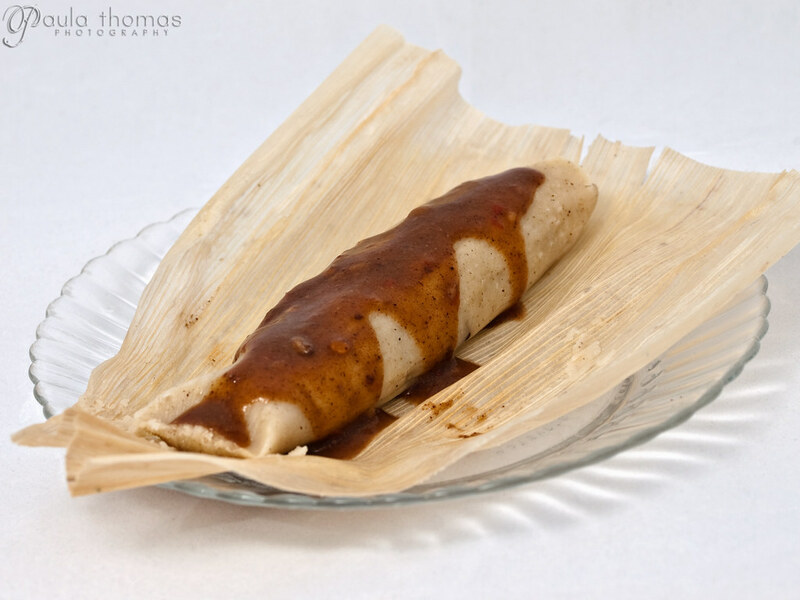 It is really fascinating to see how everyone makes their tamales just a little different. Enjoyed your post!